Notes from the BoysGoneBiking Tours. Day 1 – Girona Airport to Olot. 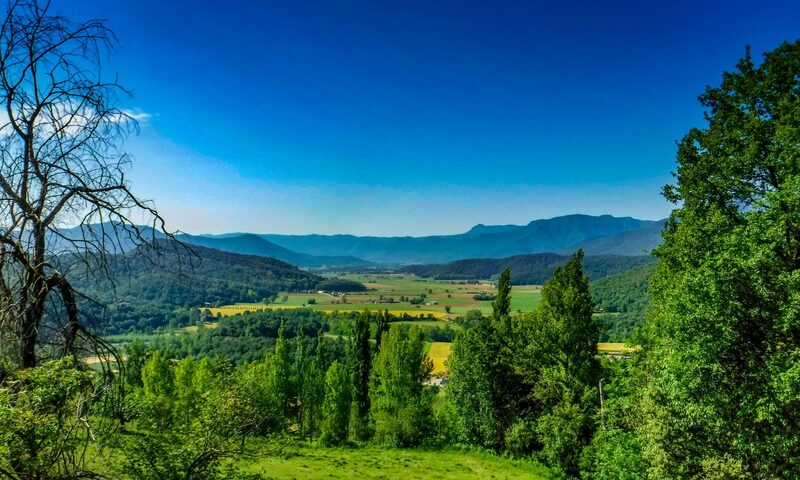 The Pyrenees mountain range sits neatly on the border between France and Spain. Pirinexus is a long distance cycle route that visits both countries and so it is obvious that you will have to cycle over the mountains to get from one side to the other. Well, it’s obvious now isn’t it? The attraction of Pirinexus to us was the speculation of vistas from mountain to sea. Somehow it didn’t seem obvious when planning the trip that we might have to climb those mountains. It also became apparent that my maths is very rusty. I think I calculated about 3,000 feet of climbing over the course of the journey. It was that magical figure of 3,000 feet that I sold the trip to Mike on. We were both convinced by the figure. I don’t think Mike trusts me anymore to make these types of calculations; in fact I don’t trust myself either. We were all packed and ready to go on a pleasant Cheshire morning. It was a little too early for our liking, but it was an early flight to get us to the start of our journey in time for a decent amount of mileage in the saddle for day one. We planned to cycle to Olot by this evening which was calculated at thirty or so miles. Not too far for the first day which would also involve flying out to Spain and rebuilding our bikes before we could get underway along the route. We arrived at Manchester Airport bright and early and checked in our luggage and bikes. The airport was fairly busy but we’d bought some FastTrack security tickets so everything went smoothly as we passed through security and into the departure lounge. We headed off to find a café for a full English breakfast – the carb and protein loading had begun. We boarded our flight to Girona and it departed early. The flight over to Spain was great with no problems or delays; in fact we arrived 30 minutes early into Girona. Being fairly early in the year, the airport which would normally be heaving with families craving the sun and poolside rest on the Costa Brava was quiet. We picked up all of our luggage including the bike bags (undamaged!) within minutes and grabbed ourselves a taxi to the Sallés Airport hotel about 1.5 km from the airport. They had very kindly agreed to store our luggage at their hotel until our return five days later. This was a crucial element to our trip and without their help storing our luggage we would not have been able to do the ride. So a HUGE thanks to the hotel for doing this for us. The first hour was spent unpacking and rebuilding our bikes and then, once changed into the BGB team shirts and Assos cream applied, we were ready for the off. It was hot outside; very hot. When training for a ride like this in the UK, the heat is a factor you cannot really prepare for. It took us by surprise and was a sign of things to come. It was 11.45am but with only 30 miles to go today, we planned to arrive into Olot during the early evening. With plenty of water on board the bikes and copious sun screen slapped on, we were off. The 2017 big ride had begun. Pirinexus is a circular route which makes life a lot easier for travelling to the start / end of the ride. Girona airport was not directly on the route but it was close by, so we had to cycle along a fairly busy 7.3km long link road which intercepted the route. It wasn’t a pleasant start to the trip as the road carried a lot of heavy goods traffic along it. Spanish roads, in common with other roads in Europe, had a wide lane at the side which made for an unofficial cycle lane. It vanished in places and pushed you back into the main flow of traffic, but for the most we managed to keep in these lanes and onto the odd road side dirt cycle path. This road passed through Riudellots de la Selva and Campllong before we hit the roundabout that intercepted the official route. The roundabout rather bizarrely contained huge corks! From here we could leave the busy road and start the official Pirinexus Route. After a little poking around (okay we took the wrong turning – not a great start), we located the cycle route alongside some farm buildings just off the roundabout and off we went along quiet off road tracks – heaven! It was a rather unassuming starting post but as it is a circular route there is no official start as such. Anyway, we had adopted the hotel as the unofficial start and finish post so it wasn’t a problem. If you read around forums and web sites about Pirinexus, you quickly learn that the signage in this western part of the route is not always the best. We also found this to be the case. Within the first five minutes travelling along the route we arrived at a junction with four possible ways to go – well three as we had come along one of them – but no signs to tell you which way to take. We did have a Garmin GPS on one of the bikes but for some reason we couldn’t figure out, the downloaded Pirinexus route only showed up as small sections and miles off route! There must have been some corruption in the data files, so whereas on previous rides it was invaluable, it proved pretty useless to us this year. We’d have to rely on the trail-side signs and maps alone. We had the official paper maps that we had downloaded from the Pirinexus web site and printed out so all we could do was relate these paper maps to Google Maps and try to work out where we were and where we were supposed to be going. After a little umming an arring we made an educated decision which luckily proved to be the right decision. The trail joined an old disused narrow gauge railway behind a farm house that was hiding the trail from view. The surface was compacted dirt but was firm enough to travel along at a fair speed. It was very dry and dusty though and we ended traveling through clouds of dust which found its way into every nook and cranny for a lot of the day. We stopped for a late lunch at the Parc Café on a Science Park in La Creueta that sat directly on the route. Spanish sausage and potato followed by a delicious apple tart with caramel sauce all washed down with a couple of full-fat Cokes was just what we needed to refuel before we continued on towards Olot. Every so often we saw signs which also told you the distance to go to various places, including Olot. It seemed to be a lot further away than we had calculated. It was whilst discussing this discrepancy in the distances that it dawned on us why Olot was so far away. Our initial route calculations had us starting in the centre of Girona. Girona Airport is some way from Girona itself as most major airports are, so we had to cycle to Olot from the airport and not from Girona city centre – another school boy error in my calculations. So rather than it being a short day of cycling, it would be a lot further than we had planned. We weren’t even in Girona yet. It would be a late arrival into Olot this evening! After our delicious local lunch we headed back along the trail and quickly hit the outskirts of Girona. The trail wound this way and that through housing estates filled with homes painted in differing pastel shades of terracotta, and along quiet roads until it headed through the busy narrow streets of Girona itself. It was a lovely looking town with grand buildings and squares full of cafes and people chatting over small cups of coffee. We took the opportunity to get some cash out of a cash machine and continued to follow the trail along the banks of the river Onyar and across a busy roundabout before heading into a local park. The trail followed some wide pathways through the Parc de la Devesa with its shaded trees which offered some welcome cool air. We passed over another branch of the river and along some more dusty tracks. The trail passed between what looked like simple allotments growing various fruit and veg. We got a little disorientated by the side of the A-2 motorway as there were a couple of tracks to follow, so we went back and forth through a tunnel under the motorway a couple of times until we got our bearings. The air in the tunnel was cool so we cycled slowly through and enjoyed a bit of a cool down. We pressed on along the dusty tracks alongside field after field of the same crop, which looked possibly like apricots or some similar fruit. We followed the off-road trail for a good long while and the signage although sparse did seem more accurate than it had been in the first part of the trail. It headed through forests of tall birch trees with their silvery trunks standing parallel in neat rows, and alongside fields with what we took to be sweet corn plants early on in their growth cycle, simply just from the appearance and shape of the green plants. The trail re-joined the N-141e. The road was straight and smooth and, most importantly, quiet of traffic. The next town we arrived at was Bescanó where the trail left the main road just before the town border and skirted around the top of town before dropping back to the road where it ran alongside but not on it. In the distance we could see mountains starting to rise up. There was a distinctive flat topped mountain dead ahead which Mike likened to the summit of Pen-y-ghent, one of the three mountains that make up the Yorkshire three peaks back in the UK. We talked about how this might have formed in the ice age – being a geologist, Mike knows a lot of interesting facts about things like this. Our dirt track kept on alongside the main road weaving into and out of small areas of trees and dappled shade, which was a welcome relief from the hot sun. The dirt surface was generally flat and straight, and was really a joy to cycle along. It kept on going, passing through Vilanna and Angleś before the road was renamed the C-63 and we parted company from it at a roundabout, heading down a palm tree lined cycle track. This track put us back on the narrow gauge railway, evident by the steel bridgework still present and the occasional platform edge peeping out from beneath the overgrown bushes. It was getting fairly late in the day by this point, about 7.30pm and we were getting a little concerned about what time we would arrive into Olot following the slight miscalculation. We had to get there as we had a room booked in a hotel. We reckoned about two hours of light were left before it went dark. That great British resolve of heads down and get on with it was deployed and so early in the ride too. The track on the narrow gauge railway wound through and around fields, but always keeping close to the road. From time to time we got glimpses of it from between the trees and houses. The track continued and then took a sharp left, down a hill and over a bridge, and on the other side of the bridge it turned sharp right clearly heading back up towards its reunion with the main road. Right on the corner of this bend was a bar – Bar and Restaurant La Parada. It was like an oasis as it came into our vision. There were a few tables and chairs arranged neatly outside the bar, one occupied by some locals engaged in a very gesticulative conversation. We saw an empty table with a large sign offering Estrella beer hung above it. It pretty much had our name on it so we took that as a hint that despite the latening hour we had to stop and order two cold beers. They tasted so good after five hours of cycling in the dusty heat. We started chatting with a man sat with the other locals. He heard us speaking English and started to chat to us in perfect English. Just a few days before we started our ride, a lone suicide bomber detonated a device at the end of the Ariana Grande concert in the Manchester Arena killing 23 adults and children, and injuring 119 others, so conversation quickly turned to this and the horrors it brought. He’d lived in Croyden near to London for a number of years before returning to his home town when he retired (which explained his good command of the English language). We talked about England and Spain and how he liked British people and our way of life, but the warmth of his home town and cheaper cost of living brought him back. We were reluctant to leave this lovely little corner of Spain but knew we were still some way off our destination, so we resisted ordering another couple of cold beers and bid them all farewell and headed off back long the trail. The trail went down and under the road to cross to the other side and then a short sharp climb brought us back up alongside it as we had expected. About 500 yards further along, the trail suddenly crossed the road and headed back on a tangent along the narrow gauge railway bed. There were a few acute twists and turns in the track, so unless the narrow gauge trains were very agile, there were some clear deviations from the original track. The track was also on a constant gradient climb. Not steep – one in fifty at the most – but relentless. The next 20 miles saw us carry on along the narrow gauge railway track with the climb continuing pretty much all the way. The trail went along a cutting through the hillside with heavy trees along both sides obscuring the view for much of the way. All we could see for most of this section were occasional huge vertical drops off the side of the old bridges, most with streams or rivers running underneath them. We passed through several towns along the way: Amer, Les Planes d’ Hostoles, and Sant Feliu de Pallerols. This section was exhausting as the climb was always there and the legs tired. I had picked up cramp in my right calf so the stops were becoming more frequent to stretch tired muscles and take on board water and glucose. Our water supply was becoming low; we had filled two water bottles each but that was proving not to be enough in the heat. A lesson learned for the rest of the trip. From here in we filled both of our water bottles and bought an additional 1.5 litres each to carry in the panniers – extra weight but well worth carrying. Eventually we left the dusty railway track to re-join the road at Sant Esteve d’en Bas. We were getting close to Olot but it was also getting dark. We spotted a petrol station at the side of the road which had a soft drinks vending machine out in front and some aluminium tables and chairs set out next to it. We were both very tired by now and needed a rest and a drink. What was left of our water was warm and dusty tasting, so to be able to buy a couple of ice cold Cokes was a joy to behold. We sat on the garden furniture sipping our Cokes, watching the sun set on a beautiful evening. Sitting outside a petrol station by the side of the road was not quite what we had hoped for our first evening in Spain, but it would have to do. By the time we had finished our drinks and rested our tired muscles, it was almost dark. We consulted the maps and made an executive decision to follow the C-152 straight into Olot. It would be busier but we were concerned that following the trail in the dark could result in us damaging our bikes, or more importantly ourselves if we hit a rut in the dark. We donned our “High-Viz” jackets, put the lights onto our bikes and headed off along the main road towards Olot. Being a smooth tarmac surface meant we made good progress along the road, and the houses, shops and restaurants of Olot soon came into view after about 30 minutes of cycling. We quickly located the Hotel Borrell in town and checked in. They had a huge underground garage in which to safely store our bikes, so we unloaded them and locked them together before hurrying upstairs to our room to grab quick shower. It was 9.45pm when we checked in so we were hugely behind schedule. Today’s 30 miler had turned into a 50 miler because of a slight (ahem!) miscalculation on my part. We went out to seek food. Every restaurant we tried to get into said they were closed so we gave up and settled for a take away. I took on board some salt to try to combat the cramps in my right calf – gross but seemed to do the trick as it did not return. Thank goodness they sold beer in the burger joint. We gobbled down our disappointing but tasty enough dinner of a “special” cheese burger and fries, and headed back to the hotel for a well-deserved night’s sleep. We had to do it all again tomorrow with 43 miles planned which would include the climb up into and over the Pyrenees and down in to France. Day 2 – Olot to Prats-de-Mollo-la-Preste. We awoke to another (predictably) glorious day. Continental breakfast is not really what you want when cycle touring. You need the carbs and protein to keep you going, but it was all that was on offer so we ate as much as we could to keep us going until we could find some meat for lunch, and then loaded up and lubricated our trusty bikes ready for the day’s challenges. Sun cream applied, we cycled back to the main road we had arrived in on and located the route through Olot. It took a left turn around a pleasant looking park where we spotted a supermarket to stock up on water and snacks. With extra water loaded into our bags, we headed off along the road which quickly turned into a cycle path by the road side, and then we were back onto the main road through the back of town. This road took a sharp left and then started to climb. Climbing was to be the theme for much of the day. We tried different strategies to manage the constant long and grinding climb. The best way we found to cope was to break it down into small sections, taking a few minutes break for rest, water and a natter every few kilometres. The road itself was just that – a seemingly endless strip of tarmac – but the views that we came across were ever changing and spectacular as we wound our way higher up into the mountains. After two hours of stopping and starting – did we mention that we REALLY don’t like climbing? – we reached the top of the Coll de Coubet at 1010m (3314 feet); we felt very chuffed with ourselves. The road then dropped down before starting to climb again (why, oh why?!) using our “Oh So Special” technique. We passed several cyclists also cycling up the mountain, some struggling as we were and others on electric bikes which appeared to take all of the effort out of the climb. We spotted a couple of cyclists at the side of the road struggling with something. We stopped to offer our help and one of the cyclists had managed to snap his chain. They had wondered if we had a chain link removing tool to allow them to reconnect it together after removing the broken link. Unfortunately we did not have one – we had left it at home! We tried to help without success so offered them our best wishes and left them to it. We kept on going up and this time we climbed to top of the Coll de Santigosa at 1064m (3491 feet). We’d done it. We’d got to the top and it was now downhill all the way. The cyclist with the broken chain passed us on the way down, speeding away. At first we thought that they had managed to mend the chain but after closer inspection it became apparent that he had taken the chain off his bike and was being powered by gravity alone. We hoped for his sake that the road kept on going down all the way to the nearest bike shop. It did, and we freewheeled down and into the town of Sant Joan de les Abadesses where we found a little road side café called Bar Clave which sat opposite a lovely old ruined chapel. We sat and rested at the outdoor tables of the Bar Clave and ordered some cheese burgers and fries. The burgers came without any buns – more like steak haché – but with lots of cheese and caramelised onion so we settled for that, and they were very tasty. They also gave us a bowl of olives whilst we were waiting, which were the nicest marinated olives I have ever eaten. I should have asked the owner what they were called so I could have got some. We sat there in the sun, bellies full of protein, basking in our day’s achievement and it was only lunch time. It dawned on us at that point that it was actually rather early in the day to have completed the hardest part of the days ride and the slow realisation crept over us that maybe we were not, in fact, finished. We sheepishly changed our map over to the next section of the trail, and much to our horror we discovered what we had feared. We had not actually climbed over the Pyrenees yet and we still had a long way to go up before we went over and down into France. Our celebrations were rather premature and short-lived. We needed to stop doing this to ourselves! We settled our bill for lunch and picked up the trail again through town and over the river Ter. There was quite an iconic bridge over the river which appears on the Pirinexus web site, so Mike offered to climb to the top for a photo – as if he hadn’t done enough climbing already today! The trail turned right after the river crossing and up a road which climbed steeply. It levelled out as it passed an old railway station on our left and then we re-joined the narrow gauge railway bed as it headed out of town. This climbed along the line of the valley and soon we were high up over the town. The trail went along country tracks and narrow trails before dropping down again to follow the river Ter through heavily wooded areas and past farms along the valley floor. It was along this section that we must have taken a wrong turning somewhere, although we did not know it at the time. The signage seemed to dry up along this section but we were finding that not to be too uncommon, so we used our maps and assumed we knew where we were as there didn’t seem to be many alternatives. The trail wound its way around the valley floor until it stopped dead at the side of a river. We could see the river was shallower in this area with a natural pebble and stone weir visible under the water’s surface, and we could see the road continuing over on the other bank of the river. This had to be the way as we could see no other way around it. So off came the shoes and socks, and we proceeded to cross the river with our bikes. The water was freezing although with the weather being so warm we didn’t mind that so much. There was a fairly strong undercurrent which tried wrestled the bikes out of our hands and the rocks underfoot were slimy and slippy. The water got deeper and I nearly lost my footing and the bike several times during the crossing. We reached the other side with all of our possessions intact although the panniers did take a proper soaking so we were not sure how well the gear inside would have fared. A quick check and all was well. The panniers had not let us down. The Pirinexus web site mentions river crossings at various points along the route so we assumed that this was just one of them. We did, however, feel that it was a bit harsh and actually quite dangerous after the event. We continued along the track on the other side of the river until we got to a junction. There was a very dodgy looking rope bridge to our left which Mike started to climb up to get a higher vantage point to look for any signs, but he quickly changed his mind and came back as it swayed, creaked and groaned beneath him. Ahead the trail disappeared along a narrow and clearly unused pathway, and to the right it disappeared up a hill towards some houses. There were no signs anywhere. At this point we got very suspicious that we were not actually in the right place and we may have just crossed a fairly dangerous river unnecessarily! We climbed up the pathway towards the houses as it was the best option we could see until we came to the road, and then we looked at Google Maps which showed us that we were in fact quite some way off the route and we had indeed crossed the river in the wrong place. The official trail was still on the other side of the river! We must have taken a wrong turn some way back and then just got hopelessly lost. We could see from Google Maps that if we continued along the road we had arrived at, we would intercept the trail in a couple of miles and get back on the proper route. So a little unsettled by our error, we cycle off again sticking to the road and followed it until as we crossed a roundabout and it changed from the N-260 to the C-38, we saw an opening in the hedge line and a reassuring Pirinexus sign on our left hand side. This was where we should have come out from the river, presumably after taking a much shallower and safer crossing. I looked at the crossing we should have taken over the river on Google Maps later in the evening, and our route would have taken us over a perfectly sensible and dry bridge. Ah, well; it adds to the richness of the trip. We’d survived the dangerous crossing of the torrential river Ter – okay, perhaps that is a bit of an exaggeration but that’s what these tales are all about. Onward we pressed as the official route joined the road we were already cycling along. The road was fairly quiet and had one of those wide lanes at the side which is just perfect for cycling along. We arrived at the town of Sant Pau de Segúries and the trail left the main road onto quieter parallel local roads, taking us past sleepy houses and farms before taking a sharp right and then a left to re-join the main road. We followed the main road again but only for a short stretch before the trail turned off it and up a very steep section paved in grooved concrete. We got off and pushed up this section as it really was too steep to cycle up it on our weary legs. Thankfully, it did not last long before it levelled out beneath a viaduct which we presumed carried the ever-present narrow gauge railway bed. This area of the trail took us through deep woods of oak trees which was much cooler and was welcome relief from the heat of the sun. It wound its way along the side of a hill and entered the back of a camp site – the Camping Vall de Camprodon. It looked like a nice camp site with a sizeable outdoor pool which would have been perfect for a cooling dip – but we had no time to engage in such activities. We left the campsite through its main entrance and re-joined the main road once again. The traffic was still light, so this was no hardship and made for some timely cycling. The road went through Camprodon itself (not surprisingly) and out the other side before it started to climb again as it headed towards Molló. The route wound its way back and forth to minimise the gradient, although it was still hard work on tired legs. It was approaching 5pm when we got to the turning for Molló and had ideas of finding a little road side café in which to enjoy a refreshing beer. We arrived at the roundabout signposted to Molló and we could see the town not too far away, but it was uphill and not on our route. We decided that any unnecessary climbing was, well, very unnecessary so an executive decision was made not to visit the centre of Molló but to press on along the route and hope we find a similar café further along. We carried on and away from Molló up the climbing road. We cycled past a sign for the Restaurant Panoramix, and we thought this is it – “Beer o’clock”. It promised a bar and restaurant nearby for all to use. Great, but when we found it about 500 yards further up the road, it was closed. Not great, but all was not lost as next door to the restaurant and bar was a petrol station which boasted that it was open for business 24 hours a day. Cold drinks and snacks would soon be ours. We cycled over to it and it too was closed! We were gutted but were not beaten. We kept on going up and up into the mountains. At least the scenery was beautiful. We made good progress and stopped for a drink of warm water and an oaty fruit bar by the road side. Not quite the cool refreshing beer we had fantasised about but it’s all we had. We had travelled quite some way from Molló in what felt like a relatively short period of time. We climbed and stopped and then climbed again as we progressed along the winding mountain road. Every kilometre or so there was a small Pirinexus sign by the road side which told us how far to the top. There was about 10 kilometres to go to the top. It also showed the gradient of the road over the next kilometre between the sign posts. Each sign seemed to show the gradient getting steeper and steeper, and it wasn’t lying! We got off and pushed in a few sections as our legs were very tired having been on the road now for over 8 hours, with many of those hours spent climbing. After a further half an hour of ascent we reached the signpost for the “Coll d’Ares”. This really was the top of the Pyrenees part of Pirinexus at 1513 meters (4964 feet). We felt overjoyed and shattered after such a long day of climbing. We celebrated with some more warm water and orange flavoured glucose sweets before cycling the final small section over the top of the Coll. It took us past the old border control building which was now a (of course closed) café, before the road started to drop away down. It is in this section that we left Spain and entered France. There was nothing more than a signpost and a change in the colour of the road tarmac to denote our arrival into a new country, but we felt a sense of relief that we had finally climbed over the mountain range and could enjoy some downhill cycling. It was almost 7pm and the sun was quickly disappearing behind the mountains. Being so high up in the mountains, the temperature dropped quickly, so we donned our jackets and helmet under-layers to keep warm. This section was the final run down into Pratts-de-Mollo-la-Preste which was our destination for this second day of cycling. It was road all the way and we freewheeled most of it. After all our efforts cycling uphill today, it was divine to get some free mileage in. The road surface had been top dressed with small stones fairly recently so we had to take care on the way down for fear of hitting a pile of loose stones and coming a cropper on one of the tighter corners as the road zig-zagged its way down the mountain side to the valley floor. The road wound its way down the steep mountain side for quite some distance before finally bringing us right into the centre of Pratts-de-Mollo-la-Preste. We were staying at the Hotel Bellevue. We stopped at a roundabout in the centre of town to contemplate where the hotel could be, and quickly realised that it was dead ahead. We could not have found a hotel more on the route. Perfect. We cycled up to the hotel which had some tables and chairs set out on a covered raised balcony area giving lovely views over the town below. We sat down and ordered the two large beers that we had promised ourselves a few long hours ago. After a relaxing half hour supping our beers and enjoying the warm evening, the lady serving us asked if we were staying. We told her that we had booked into her hotel and would like dinner. She advised that dinner stopped at 9pm so we had to cut short our chill-out time to grab showers and get changed before the restaurant shut. Before we left the UK we checked with each hotel that they could safely and securely store our bikes overnight. Our choice of accommodation was based on this as well as having a close proximity to the route. We asked the hotel receptionist where we could store our bikes and she gave us a blank look. She said there was a car park in the field behind the hotel. I went to have a look and all I found was an open field without anything to secure the bikes to or anything to stop people walking into the car park and pinching the bikes or equipment off them. We were not amused because if anything were to happen to our bikes then the trip would be over. We decided to strip everything we could off the bikes and padlock them to the railings outside the front of the hotel; they were heavy and firmly fixed wrought iron railings so would provide a solid anchor to attach them too for the night. Not ideal but it is all we had to which we could secure the bikes. In my experience, the décor in France is always more rustic than other countries and this hotel was no different. It was all rather small and old fashioned compared to the spacious modern room we had stayed in the previous night in Olot. We grabbed quick showers in the smallest bathroom ever known to man and then it was straight down to the restaurant for dinner at bang on 9pm. The TripAdvisor reviews for places to eat in Pratts-de-Mollo-la-Preste gave the Hotel Bellevue restaurant, the “Bellavista”, as the #1 place to eat, so we had high expectations. I am glad to say that we were not disappointed. We had booked a Half Board package so we did not get to choose from the full menu, but even so, what they served was delicious and to a fine dining standard with great presentation and flavours. We had a rich cheese and bacon tart to begin with (bit like a quiche), followed by a veal dish – “Vedella des Pyrénées”, accompanied by local vegetables and a beautiful sauce. There was a toffee sponge pudding for dessert, all washed down with a lovely bottle of local white wine. We retired to the bar for a nightcap and then off to bed for some well-earned rest. We were exhausted after such a lot of climbing and still had three days of cycling ahead of us, but we were full and happy. Day 3: Pratts-de-Mollo-la-Preste to La Jonquera. Another warm and clear blue skies morning greeted us, and the bikes had survived the night unscathed strapped to their wrought iron fence. We headed down to the breakfast room to fill up on the usual fayre of croissants and cakes before packing up the gear and loading the bikes ready for the third day of our adventure. Today’s destination was La Jonquera some 43.5 miles away. Having done a lot of climbing yesterday, we were hoping for an easier time in the saddle with some downhill sections. We found the local supermarket which was quite hidden away, being set back from the road and tucked between two other buildings. We bought our daily stash of water and oaty fruit bars before heading off downhill – a good start to the day. The route followed the D115 out of Pratts-de-Mollo-la-Preste and wound its way alongside and over the river Ter, criss-crossing back and forth. There was some traffic on the road but being away from any big towns, it was fairly light and bar one idiotic motorcyclist cutting us up, the drivers were mainly all courteous and careful. We passed through several towns as we followed the road – Le Tech, Can Partére, Arles-sur-Tech and El Calciner to name a few. The trail parted from the road in El Carciner and turned into a much more enjoyable dirt track which sat on the old narrow railway bed; we were seeing a lot of this narrow gauge railway on this tour. The course followed the road and the river but at least we were away from any traffic. All the while we followed the trail there were great views to our right down towards the valley floor. It is on this section that we passed the 100 mile mark. We followed the trail over a very high bridge and then through a tunnel at La Forge before passing over an unusual covered steel bridge crossing the river Ter once again in Le Pont De Reynes. So far today we have been steadily heading down hill, which was a welcome relief after yesterday. We knew we had to get back into Spain at some point today as that is where our destination lay, and that of course meant we had to cross the Pyrenees again at some stage. From the route profiles shown on the official web site, we knew the climbing was not as severe as yesterday but we still anticipated quite a lot of effort would be needed later in the day. We tried not to think about it too much just yet and pressed on. We passed through the sprawling town of Cabanassa which quickly merged with La Pont due Ceret and La Porte Du Vallespir before the trail left the built up areas and started to track along field boundaries. We cycled this way and that as we followed the edges of the fields. It was very reminiscent of the Way of the Roses where we spent a lot of time following the trail around field boundaries, often three sides of a square. The relative peace and quiet of the countryside didn’t last long as we arrived into another town (Saint-Jean Pla-de-Corts). After a brief passage through a residential area, the trail took us into a park area with a huge lake – Lake Saint-Jean Pla-de-Corts. This lake was very impressive and was used for water sports and recreation. There were groups of people sitting by the lake in the sunshine or cycling gently alongside it chattering away to each other. There was a Go-Ape type adventure course in the trees behind us. It was a lovely scene and a great looking place to spend a day; but we couldn’t stop for long and had to keep going. Further along the trail there was a second lake devoted entirely to cable skiing. There were some people enjoying the water and going over the jumps. It looked like fun but on we went. The trail wound over the busy A9 / E11 motorway before continuing along the course of the river and into Le Boulou where it turned from an easterly direction to a southern one. We were heading towards Spain again. We cycled along the trail as it followed the A9 motorway once more before crossing over it via a bridge. The trend of cycling around field boundaries carried on and along this section another cycle tourer caught us up and said hello in English but with an Irish accent. We of course said hello in reply and starting chatting. The chap was called Michael (easy to remember) who was originally from Dublin, although he had lived all over the place including Altrincham, so he knew where Northwich was. He was cycling from Heidelberg in Germany to Malaga in Spain all on his own. He couldn’t persuade anyone to go with him despite some of his friends initially agreeing to go; they’d all found excuses when it came to the crunch. He was filling his days with cycling, drinking beer and smoking weed. Despite his poor habit choices he was a nice guy with some interesting stories to tell, and we decided to travel along the way with him for a while. He had come down from Germany, through the corner of Switzerland and then on into France via Geneva. He passed through Lyon and down to the Rhone valley and on through Montpellier, heading southwest to the Spanish border. He was camping rather than using hotels and his bike was heavily loaded with all his gear including a tent and sleeping bag! He was cycling in sandals and a vest top. We were glad to see a helmet on his head, even if it sat loosely at a jaunty angle. He was clearly chilled out (might have been the weed!) and was enjoying his tour. He had not spoken properly to anyone for three weeks so he was keen to chat and swap stories with us. He had recently split with his girlfriend so wanted some time to reflect and basically forget all about her. His destination for the night was Figueres, the home of the recently exhumed Salvador Dali (over a paternity claim which proved to be spurious), which was a considerable further distance than we had planned for today. We kept on as we swapped our stories and experiences about our respective tours so far. He was very inexperienced in the saddle and just came up with the idea over a few beers with his friends (sound familiar Mike?). He bought a bike from Decathlon and some gear and then everyone backed out, so he thought rather than not go he would go it alone. He had arranged to meet up with people he knew in various places along the route but the travelling was a solo tour. We liked his attitude. He had only really had one technical issue with a puncture in France, which is quite impressive for the distance he had done, and he shared our hate of busy main roads and hills. We arrived into the next town of Maureillias-les-illas around about lunch time. We cycled along atmospheric narrow streets will three and four storey houses looming over us which provided some shade from the hot sun. The El Tap restaurant appeared in our view so we stopped and bought Michael lunch. It was a lovely little spot, tucked away in the corner of a little town square. We ordered some omelettes with fries plus a couple of Cokes for Mike and I, and beers for Michael (of course). We could have sat there all afternoon but and all too soon it was time to carry on. We wound back and forth as we passed through the narrow streets and then the road started to rise. The anticipated climb back over the Pyrenees and into Spain had started! We adopted our now well-rehearsed approach of cycling the climb in small sections and having a rest in between, whereas the younger Michael kept more to the philosophy of keep going come-what-may until you get to the top. We said our farewells as we did not want to hold him back, especially so bearing in mind the distance he was planning to go before the day was out. We plodded on and after an hour of climbing we saw Michael lay down on some stone benches by the road side up ahead. He had got to the top and decided it was time for a spliff, so he was chilling out in the shade of a large tree. We stopped and joined him – for a rest that is, not a spliff! He had no maps for the next section so he took some photos of ours on his phone. After a little more chatting he decided to head off. We decided to have a chocolate biscuit first. We finished up our biscuits and then came to the decision that we needed to carry on and get back to the road to see if we could climb to the top of the mountain. According to the maps, if we could get to the top of this bit then it would be downhill all the way into La Jonquera. We packed up and carried on. The road slowly wound around the contours of the mountain and then, though a gap in the trees, we could see a large fort atop the hill. We surmised that this fort, the Castell de Bellaguarda, was likely built there to guard the gap in the mountains that went over from France to Spain to stop all of those Spanish invaders from coming over into France, so we must be close to the top of the climb. The road seemed to take a tortuous route along the mountain side until finally, after several stops and starts, the gap in the mountains came into view. We were almost there! Another fifteen minutes passed and we arrived at a Pirinexus information board which sat at the top of a steep path heading down. We congratulated ourselves with glucose sweets and some water and took some time out to read the information board. It explained all about Pirinexus and the geography of the area we were in. The only way from here was down and we could already taste the cooling beers waiting for us at the bottom. We headed down the path from the top of the hill and back into Spain. There was no obvious sign but there was an immediate and stark change in the quality of the surface of the trail. Suddenly we were fighting with loose dirt and stones and deep ruts, a far cry change from the smooth concrete surface of the trail on the French side. Progress down the steep rough track was slow and we realised that this would take us a lot longer than we had hoped. Perhaps those cool beers were not so close after all. We got the bottom of the steep part and headed along a flatter but equally rough path. Up ahead was a cyclist walking towards us pushing a bike; it was Michael and he was looking a bit distressed. He told us that the path up ahead became impossible to pass due to the steep gradient and loose surface. He had tried and he couldn’t push up it let alone cycle up it. He said there were birds of prey attacking him and it was frightening. He thought that it was the wrong way and we shouldn’t risk going any further. We checked and rechecked our maps against the signage and it all seemed right to us. He took a decision to go back to the road and cycle around to the next town on that. It would be a long detour to do that and it would add considerable time and distance to the itinerary. We checked our maps again and we were certain we were on the right track so we took the decision to go and at least take a look. Michael was not going to follow us and so we said our goodbyes for the third time that day as we parted our separate ways once more. That was the last time we saw Michael. We hope he enjoyed the rest of his trip and arrived in Malaga safely. We pressed on, eager to investigate this impossible route. The trail carried on and went up and down a couple times; the surface was still not the best but so far so good. We rounded a corner and saw a steep incline up ahead. This must have been the slope he was referring to. It was steep and the surface loose but it didn’t look impassable. We both pushed up each of our bikes in turn and got to the top without too much trouble. We supposed that Michael’s bike was heavier being a cheaper model and with more bits of luggage attached to it, with just himself to push it up the hill, and with sandals on his feet, we could see how he might struggle. We didn’t, however, see any birds of prey circling menacingly above us waiting to attack. That might have been the “Wacky Backy” talking! We carried on downwards. It was slow progress because of the poor condition of the trail surface and the steepness of the gradient in places, but we picked our way carefully down. Ahead, in the bottom of the valley, we could see a railway line and a motorway running side by side, and beyond that a town. According to our maps, that town was our destination for the night; La Jonquera. The previous two days had been long and hard. Today was not easy but we were making fairly good time so we should, in theory at least, have a less rushed evening. The trail passed under the railway bridge we had spotted from higher up the mountain and approached the motorway, heading underneath it but not crossing it. We didn’t think that many people had cycled this part of Pirinexus recently as the trail was very narrow and overgrown along this section. We picked up scratches on our legs from the brambles spilling over onto the trail. Underneath the motorway bridge, the trail disappeared into huge deep ruts full of stagnant water and debris. You could not ride along it at all. We could see heavy machinery and the steel framework of a bridge which was under construction. When the bridge is completed we could see that it would improve the trail in this area but for now we had to fight our way across. We took each bike one at a time between us and lifted them carefully over the deep ruts, using small rocks in the water as stepping stones. It was pretty treacherous and a slight wrong footing could have resulted in a twisted ankle or a broken limb. It was not nice at all. We took our time and managed to cross the area safely. We regrouped on the other side, took a minute to settle our nerves and set off again along the now much smoother trail which followed the AP-7 motorway towards La Jonquera. After a short distance there was an underpass beneath the motorway which took us to a side road that joined up with the main road through the centre of La Jonquera. As was now customary, we quickly found a little café bar and order a couple of large cool beers. They tasted incredible and the difference in price between France and Spain was startling. We had paid four to five times more in France for two beers yesterday than we did today. We enjoyed our beers and the little nibbly bits they give you before saddling up once more in search of our hotel for the night. As said before, we had chosen all of our hotels to be right on the route (or as near as possible), and today was no exception. It was a little out of town near to a large covered shopping centre. We followed the quiet main road southwards and found the hotel after a little searching around. It was the Hotel Tramuntana and it was modern, bright and airy with nice sized rooms. They allowed us to store our bikes in their Conference Room which made us very happy, unlike the previous night. We had more time on our hands this evening so took baths to soak our tender muscles; all very relaxing. I could have fallen asleep there and then, but we needed to eat. We had looked on TripAdvisor for the best restaurant in each town we were staying at and La Tagliatella came out as #1 in La Jonquera, and coincidentally it was next door to the hotel in the Shopping Centre. We couldn’t have planned it better. So we headed off in search of delicious pizza. The restaurant was found easily on the top floor of the centre. It was decorated very flamboyantly with lots of colourful twiddly bits and chandeliers. We had a great meal of pizza and puddings washed down with beer and wine. The staff were really welcoming and helpful, so if you are in the area then it is must go to place for a nice relaxing and tasty meal. We popped into the Super Market that we had spotted inside the Shopping Centre on the way back to the hotel to save some time in the morning. We headed back to the hotel and quickly fell asleep after another adventurous day in the saddle. We wondered if Michael ever got to his destination that night as we drifted off to sleep in our comfy beds and air conditioned room. Tomorrow would soon be here and it was to be the longest distance day of the tour so far. Another blue skies day dawned in north east Spain and another continental breakfast was consumed. We were getting a bit sick of cakes and pastries in the mornings by now but no other choice was on offer. We were up early as the distance we had to cover today was 62.5 miles, nearly 20 miles further than yesterday. This decision was made, perhaps foolishly, some time ago during the planning stages so we could stay in a Mediterranean seaside resort. It sounded like a great plan on paper. Now we were staring it in the face we were not so sure. We loaded our bikes and completed our daily bike checks and lubrication, before heading out to get back onto the trail which we’d spotted last night on our way in. The trail continued just behind where the hotel was located so we were able to quickly find the path again. It was a steep concrete road, so five minutes into the day we were off the bikes and pushing up the steep slope. It would be a very long day if it was all like this. Thankfully it wasn’t all like that and after a couple of small uphill bits it levelled out making it easier on the legs so early in the day. The trail passed along dusty tracks, winding between small tree-covered hills and alongside small lakes. We arrived into the sleepy town of Capmany where we saw not a soul. We didn’t stop for long to find any either. The path continued on through fields again. It was all nice and flat and made for some relaxing cycling in the glorious Spanish sunshine. At one point, up ahead, the path crossed a river; here we go again, we thought! Luckily this time is was shallow and only 20 feet wide so we just cycled our way through it. It only came up the bikes a few inches so the worst that happened was wet feet. The state of this river crossing – narrow and shallow – made us realise just how bad our earlier escapade with the River Ter had been! Heading down towards the sea, the land was all largely flat and the trail swapped and changed from dirt trail to tarmac road – all still fantastically quiet. We made good speed along the trail which twisted and turned to follow field boundaries. Our route straightened out to follow the Canal Gros – lovely name which luckily was not too gross! We took a sharp turn to the right to leave the canal and re-join the road. We stopped to change over a map at this junction and to have a drink. To our left, in the distance, we noticed a castle which looked very impressive. It was called the Castell de Biart and in days gone by it was an enormous fortress. It was the home to Pere de Biart, his wife and his son Gasto V which is where the name is derived from. It was left in ruins for decades after its destruction by the Napoleonic invasions. It is now owned by a wine making company, producing Castell de Biart wines. The castle itself is being restored to its former glory by the new owners and the land around the castle is used to grow the vines hosting the grapes varieties used in their selection of fine wine. It looked pretty impressive from where we were standing. After our refreshment break, we carried on towards Peralada. As we approached the outskirts of Peralada we seemed to be cycling along the route of a running race, so we had to be careful of the runners. There were some obviously good and very serious entrants, and few clearly just having a go. There was one particular lady who looked uncomfortable and like she as struggling compared to the others, but she just kept on going. We take our hats off to them. It was baking hot and not really good running weather (is there ever good running weather?). The race seemed to end in Peralada. Having avoided the race officials who seemed to think it was a good idea to stand right in the middle of the road and not move out of the way when we approached them on our bikes, we arrived at a roundabout which I had spotted on Google Maps during the planning phase – Google Maps is so useful when looking at these routes. It is comforting to recognise somewhere on the route so you know you are not getting lost. The trail continued off an exit from the roundabout and then swung a sharp right to go off road again and back onto the now familiar dusty track. We seemed to pass through rows and rows of bushes which had small green fruits on them – we thought they may be apricots again but we were not really sure what they were. We cycled along the trail, crossing a dry river bed (no wet feet – hooray! ), and past the towns of Vilanova de la Muga and Castelló d’ Empúries, passing underneath the busy C-260 by way of a tunnel before picking our way once more along and around the fields. We approached the town of Sant Pere Pescador around about lunch time so decided to find somewhere to rest and refuel. The town had the feel of a touristy seaside town, even though it was not directly on the coast. It was not, however, far away from the coast and sat in the Bay of Roses on the River Fluviá. We had a look at the menus of a few nearby restaurants and settled on the “Snack Bar and Restaurant Bon Punt” which was right on the route. Not an attractive or appetising name but the menu looked pretty good so we went in. The menu was one of those detailed in photographs of the offerings which is a sure sign you are on the tourist trail. It had a nice covered eating area to the side of the restaurant under which we could keep out of the sun, so we pushed our bikes in and settled down on a table with our customary Cokes and ordered a couple of half Roast Chicken with chips. It was tasty enough although Mike did have some pink bits in his which were a bit off-putting. Having a bad stomach whilst on a cycle tour would not be much fun at all and so Mike opted to leave it on the plate; a wise choice. It was relaxing, sat in the shade keeping out of the midday sun, and it was getting progressively harder to pull ourselves away from our rest stops the longer we had been on the road, but having completed only twenty five miles of the planned sixty two, we pulled ourselves away and carried on. The trail continued onto a bridge over the River Fluvià. The river didn’t look very deep down there, but too deep to wade through. We spotted some enormous fish swimming in and around the pond weed. The trail hit the road for a short section before turning to follow the side of the River Fluvià passing the local yacht club. We missed the turn and carried on down the road for a few hundred yards before realising our mistake and turning back to locate the signpost that we had missed. Back on track, we found the pathway by the river side and followed alongside the water. It looked deeper from here than it had done from the top of the bridge. We followed the river for only a few hundred yards before we turned back south again following parallel to the coast. We kept getting glances of the sea in gaps in the skyline and we could see the trail was heading slowly but gradually towards the coast. We passed through Empúries as the pathway turned eastwards and then a branch off the wide path took us down a narrow overgrown track which pushed us out on to the road. We reached a roundabout without any trace of a Pirinexus signpost and took a wrong turn. After a conflab over the maps, we turned about and decided we needed to take the other exit off the roundabout, which took us along a pedestrianised area and finally we arrived at the coast in the town of Sant Martí d’ Empúries. It looked beautiful. The beach was soft sand and the water clear. It was very busy on the beach being a Sunday, with young families all playing beach games and enjoying the water and sunshine. We stopped for a few minutes to take in the scene in front of us. Deep blue skies flowed down in to a clear sea which gently lapped the shore. The beach was soft golden sand and looked incredibly inviting. We were approached by a man on a mountain bike. He had heard us speaking English and got chatting with us. He was a British ex-pat who was sick of the London rat race and came to live in Spain a few years ago. Not a bad idea. Living the dream? Perhaps he was. The route hugged the coast for quite a way. It was a shared pedestrian / cycle path and it was very busy so the going was slow. We passed some old ruins which looked interesting – the Ruïnes d’Empúries, which is an excavated ancient city with a wharf, forum and an attached archaeological museum. It would have been great to explore but we still had a long way to go so we had to pass it by. The coast-side pathway ended in a car park and the trail continued down the main road. We were getting short of water today despite taking three litres each on board, so we headed off to the local supermarket in search of more. It was closed. Unlike the UK, shops in Spain do not seem to open on a Sunday. We found a petrol station and having no other choice we bought another three litres for a lot more money than we had paid in the supermarket on the previous night in La Jonquera. We followed the GIV-6322 out of town, up a bit of a climb (how rude) until a dirt track took us away from the road and alongside a narrow river and back into now familiar territory. The trail wound back and forth and then straightened out alongside the Rec del Moli, a river which ran from the town of Colomers out to the coast. The riding was flat and we made good going. The trail passed through Bellcaire d’Empordà before parting company with the river and crossing the main road to carry on along a narrower dirt track. We passed an ugly quarry which had been cut into the hill side and then a hill with a castle on the top came into view on our left side. This castle stayed with us for some time as we cycled our way towards it, around the hill it was sat upon, and then away from it. The castle was the Castell de Montgrí. It was built between 1294 and 1301. Its reason to be was the existing conflict between the counts of Empúries – who ruled over most of the area around the town – and the counts of Barcelona, the most powerful in Catalonia at that time, who also had great power over the Mediterranean. It looked quite impressive sat atop its hill and would have been tough to approach without being seen. Thankfully, things were a lot more peaceful in the area these days and it has been turned into a tourist attraction. We passed through the town of Ullà. The trail took us through the largely narrow and not particularly pretty built up back streets of the town, before crossing over a roundabout and once again heading into countryside. It was off road on a dirt track again but it was flat enough to keep our pace to a reasonable speed. The adjacent fields had frames supporting a tall crop. We were not sure exactly what it was but it grew with abundance in this area. Every so often there was a mountain of wooden crates which we assumed was the transport waiting for the crops to ripen. As we moved ever southwards, we slowly left the Castell de Montgrí on its hill behind. We joined alongside the River Ter again as we bypassed the town of Torroella de Montgrí. The word Montgrí refers to the Montgrí Massif that dominates this area and the one with the castle on top. We crossed the river over a road bridge before the path back-tracked along the opposing bank then turning south again. Apart from the odd short climb, today had been a flat ride around fields and along river banks as we had hoped. This carried on as we passed though the quiet towns of Fontanilles and Fontclara. Approaching the outskirts of Sant Julia de Boada saw us return to the roads. The smooth surface was a welcome relief after a lot of miles travelled on the rougher dirt tracks. The dust gets absolutely everywhere including into your ears and up your nose! We stopped for a breather in the centre of the town outside the Restaurante Can Joan. We were tempted to pop in for a beer but decided against it because the clientele were all rather well dressed and we were hot, sweaty, dirty and under dressed in our lycra attire. We kept on going with the promise of a stop at the first more appropriate establishment we came across. The largest town before our destination for the night was Palafrugell and the Pirinexus signpost opposing the Restaurante Can Joan indicated it was 8.9km away. We were on mile forty nine for the day and so had about 14 miles to go and it was heading towards 5pm already. All being well we shouldn’t arrive at the hotel too late. I had booked us a table at the El Horreo restaurant in Sant Antoni de Calonge for 8.30pm, so we thought that we should be fine as long as we don’t experience any significant delays or technical problems with the bikes. We left the road and re-joined the dirt track out the other side of Sant Julia de Boada. The town of Torrent soon appeared and we hit tarmac again through its centre. The main road through the town approached a T-junction but the trail itself headed across it and back onto dirt tracks. A sharp right turn past a nice looking house took us into and through a deeply wooded area where the path climbed a little. It was quite hard going as the ground was strewn with larger rocks and was heavily rutted. It was only a relatively short section and we soon popped out the other side and back onto farm tracks. A right and then left turn took us across an open field where some overgrown brambles were only too happy to scratch our legs again. Back through some more woods with dubious quality cycling surfaces followed by more field crossings, and even more woods, took us finally back to a quiet tarmac country lane. This combination of woods, fields and country lanes continued until we arrived at a more major road. It looked a bit busy and unpleasant but thankfully there was a separate cycle lane away from the road itself so we headed to that for a more relaxing ride. The area ahead was much more built up and industrial – we were approaching the town of Palafrugell. The cycle lane continued alongside the main road until the next roundabout and then it vanished. We could not see any signposts for the Pirinexus. The maps seemed to indicate that the trail went over the roundabout and carried on along the main road, but the road ahead was closed. Mike had a scout around at the other exits in case we had missed a sign post somewhere but there was nothing. A car approached the roundabout from along the closed road so we thought that there must be something down there, and as we were on bikes we would be able to get off and walk them around anything significant blocking our way. An executive decision was made to go along the closed road and see where it took us. The road wound around remaining fairly level until coming to an end at another roundabout which also showed it as closed. There was no blockage in the road between the two road blocks and we could not see any reason why it was closed; all very odd. We crossed the second roundabout and the road quickly started to climb so it was heads down as our tired legs pushed the heavily laden bikes up the hill. It was not a long hill so we stopped at the top for a quick rest before freewheeling down the other side. We also spotted a Pirinexus sign off to the left as we zoomed down the hill and right past it. A quick stop was made and an about turn to join the track, which left the road at an oblique angle and headed on into town. We cross the main road through Palafrugell and pulled up on a wide boulevard to get our bearings. There were signs on both sides of the road so we stuck to the right being in Spain and all, and headed alongside a dual carriage way on a cycle path. This ended at another roundabout and the signs indicated that we should cross the road and head off into a more residential area of the town. We followed the quiet road and were soon directed left back onto a dirt trail. This track headed back through the usual fields and past large greenhouses. It kept us off any roads all the way down to Sant Joan de Palamós. Cycling into town we could see that there was a definite nautical theme going on, with numerous shops appearing to sell all sorts of boats and related paraphernalia – Mike was in heaven. I pulled him away from staring and drooling like a school boy into the showroom windows as we located a cycle path down the side of the road. This took us right through town and alongside a busy motorway. It wound its way ever towards the coast until we finally saw the sea again. The town of Sant Joan de Palamós merged with Sant Antoni de Calonge and we soon found ourselves cycling along the promenade searching for our hotel. We were booked into the Hotel Rosamar for the night. We cycled the full length of the promenade. It was a beautiful smooth promenade with a perfect looking beach. There were quite a lot of people milling around enjoying the early evening sunshine. We saw three T-shaped projections jutting out from the beach which created artificial round coves around which people could sit and enjoy the sunshine. It also calmed the water to make distinct little bays. We struggled to find the hotel at first and so cycled back along the promenade again before spotting the hotel to our left. We checked into the hotel. The receptionist tried to suggest we take our bikes and leave them in an open air car park around the corner. We politely but firmly declined and insisted that they were kept in the hotel as we had agreed via email before we came – we weren’t going to risk leaving them outside again, especially is a busy little town like this one! She eventually concurred and allowed us to store them in a large store room which was more than adequate. Before we went to the room, we headed to the bar for the promised cold beers. Two large ones were ordered and consumed with speed. The time was getting on and it would have been a rush to get changed and over to the restaurant by 8.30pm so we asked the receptionist to call the El Horreo restaurant and see if they could move the reservation back to give us more time. The restaurant obliged and moved us to a 9.30pm slot. The room was a good size and the bathroom smart enough with a good powerful shower. We had paid a little more for a sea view so we sat on the balcony for a few minutes and took in the view. Moving the dinner reservation back gave us time for a nice shower and to change our clothes before heading into a taxi to get to the restaurant. The taxi driver picked us up. He was a nice chap who seemed surprised we wanted to go to the El Horreo. “It’s very good but it’s expensive”, he warned. We said we knew it wasn’t cheap but after a long day in the saddle we thought we deserved something special. The restaurant was only a few minutes away but we booked him to pick up us later on as the thought of walking even that short distance back to the hotel was not appealing with tired legs. The restaurant was very smart looking and the Maître D’ sat us at our table in their gardens which was so atmospheric, with relaxing music playing and the whole area subtly lit by lanterns hanging from the trees. Despite being outside there was not a single insect; no idea how they did that. We were given a glass of bubbly to begin our meal and a small selection of horsderves, which were delicious. I ordered octopus and Mike had mussels to start, and they were both delicious. For our main course we both had the tenderest piece of veal I had ever eaten, accompanied by beautifully cooked vegetables. We finished with a caramel sponge and ice cream – a posh version. It was a delicious meal and with an excellent bottle of wine recommended to us by the Maître D’, and coffee, was not as expensive as we were expecting. Great value and well worth a visit if you are in the area. Our taxi arrived as promised and took us back to the hotel. The bar was closed at the hotel so we headed off into town to see if we could find a night cap. Despite the earlier bustle of people along the promenade, at this late hour the town was fairly quiet as it was early in the season. Most places were closed but we found an Irish Bar further along the promenade that was still serving. We sat in there for a couple of hours enjoy a few beers and putting the world to rights. It was the first time we had managed to have a “proper” evening on this tour due to our long days, and it was great fun. We headed back to the hotel before it got too messy and had any impact on the next day’s cycling. The day’s longer distance had worked out okay as there was not a lot of significant climbing. It also meant that our last day promised to be shorter as we wound our way back around the loop of Pirinexus and back up to the Sallés Airport Hotel at Girona Airport. It didn’t take us long to drop off to sleep as we were a little beer hazy and very tired after putting 63 miles on the legs. The day dawned clear and blue again. Despite a few pints in the Irish Bar the night before, our heads were surprisingly clear. It must be all the fresh air and exercise we were having. We had a bit more time on our hands today as the distance back to the Sallés Airport Hotel was 26.6 miles, significantly less than previous days of the tour. The booking at the hotel was room only so after showering and dressing we decided to head out into town and find a restaurant for a greasy slap up breakfast. Nothing was open apart from one place offering croissants and orange juice – no thanks! We found a local Spar shop and bought our usual provisions of water and oat bars for the day, and then we decided to get back on the road and see if we could find somewhere better for breakfast further down the coast. We loaded up the bikes and check them over as was now our normal morning routine. We settled our room bill and headed out onto the promenade. Pirinexus continued along the promenade right to the end of the bay before heading inland and tracking the coast road. We cycled to the end of the bay and took the road inland. The route past by the El Horreo restaurant where we had enjoyed a lovely meal the night before, and onward tracking parallel to the sea. There were numerous large hotels and a large camping complex along the coast road. We had clearly hit the tourist area of the Coast Brava. We arrived into Platja d’ Aro which was a relatively large and busy town, and started the search for a café serving some stodge. We found a little café bar (appropriately called Antonio’s Bar) on a side road off a large roundabout, and he was serving sausage, egg and chips. Perfect! Two big breakfasts were ordered and we sat enjoying the food and watching the people wander up and down the street going about their holiday business. A hen party came into the café as we were finishing up our breakfast and was clearly excited about their plans for the poor hen. I am sure they had a great time even if she did not. We kept on along the coastal road as the Pirinexus website advises that signposting is poor along this part of the tour but you should follow the coast. We followed the road which slowly diverged away from the coast line heading slightly inland. We found a Pirinexus sign at the side of a roundabout which had three directions to follow. One is from where we came and the other two were in opposite directions! We decided to keep heading forward and so crossed the roundabout and kept on a track at the side of the road. This track eventually crossed over the road and was signposted steeply down back towards the coast through the port town of Sant Feliu de Guílexols. We were on the right track. It passed along the streets at the back of the town before joining a narrow gauge railway bed. This took us right to the edge of the port where we were greeted by a huge harbour full of small and large boats. The trail went past a large visitors centre and café, and came to an abrupt end at the wharf. We wanted to explore further so we decided to cycle along the wharf to the very end and have look out to sea. The sky was still mostly blue but there were a few wisps of cloud forming in the distance and there was a gentle but refreshing sea breeze blowing in towards us. After several minutes spent having a rest and taking in the view, we headed back along the wharf to the visitors centre. We cycled back along the harbour road until we found where we had come from. We couldn’t see a sign for the next stage of our journey but we knew from the website that the signs in this area were unreliable, so we headed off along the coastal road to reach the bay we saw from the wharf. The buildings around the bay were nicely old fashioned and well maintained, giving the area a lot of character. We had it in our minds that the way forward was over to the peninsula on the opposite side of the bay, and we married this up with the maps. At the end of the bay the road started to climb quite steeply, so we plodded our way up slowly, taking in the views out to sea as we climbed higher and higher. We kept on going and it seemed to get steeper and steeper and not really turn northwards which we felt it should be doing by now. We stopped when we got to a cross roads after a steep section, for a rest more than anything else, but we also spotted a sign at the side of the road; we checked it out. No mention of Pirinexus at all. We looked at each other and doubt set in across our faces. We opened up Google Maps and checked out our location. We were miles off route! We cross-referenced the papers maps with Google Maps and we realised that we should have returned back along the narrow gauge railway bed by the harbour until we reached the large signpost on the roundabout with the three exits for Pirinexus. We had taken the right track to the harbour but it was a branch off the main loop just designed to take you to the harbour for some sight-seeing. It was used to get there and back again. We had climbed several hundred feet and done extra mileage for no reason. We tried to be philosophical in our error and enjoyed the spectacular views over the sea as we back tracked down the steep hill. We could see a long line of fog rolling in off the sea towards the coast – a fog bank was heading our way. I had never seen one before so we stopped to watch it hit the shore. The fog bank made land fall at the bay and then quickly dispersed over the town, soon clearing back to blue skies. I am not sure quite what I was expecting but it seemed a bit anticlimactic to me. We rode around the bay again and back towards the harbour. We arrived back at the entrance to the pathway which took the narrow gauge railway bed, following it back up it to track the back streets of Sant Feliu de Guílexols once again before reaching the main road heading back out of town. We kept to the cycle path alongside the road until we arrived back at the large Pirinexus signpost on the roundabout. Closer inspection of the third cycle path exit off the roundabout showed it to point its way towards Girona! We took this path and headed off again, this time on the right track. It was the narrow gauge railway cycle path again. The pathway was a dirt track but was pretty smooth and level. We hoped to make up some of our lost time on this surface. The trail went past a large field with a grass runway in the middle of it before passing underneath the C-31 through a tunnel and then over a bridge, and past a High School. We were back in Castell Plat’ja d’Aro heading northwards. The trail cut a curved line through the town along the railway bed. The trail re-joined the quiet road up ahead and we passed a park on our right which had one of the narrow gauge engines on display. We thought that as we had spent a lot of time over the last few days on the narrow gauge track bed we should stop for a look and get a photo with the engine. Up ahead on the left side, Mike spotted an ice cream van and we quickly made the decision to get some ice cream. As we approached the van we rather embarrassingly realised it was parked in a garage, probably waiting to be repaired. We would have to wait before we could treat ourselves. The dirt track continued straight ahead as the road turned left and right. It was long, straight and flat. You guessed it – it continued on the narrow gauge railway bed. The trail eventually met with the main road although it kept us off the road itself on a track just to the side separated from the road by a wooden fence. We crossed over several of the frequently met old steel railway bridges as we made good progress northwards alongside the GI-662. Every now and again along the trail we came across old railway station buildings, and at Sant Christina d’Aro we came across one which had been converted into a café and Tourist Information Office. We stopped for our promised ice creams and had a couple of Cokes too to top up the blood glucose levels. We sat on old wooden rocking chairs whilst enjoying our refreshments and did some people watching. There were a lot of cyclists enjoying the trail today and most nodded a quick “Hola” to us as they rode past. It was early afternoon when we prised ourselves out from our rocking chairs at the station café. The sun was high in the sky and as scorching hot as usual. The trail was still flat and we were making good speed after our little treat at the Station Café. The cycle path crossed the road but kept by its side for quite a distance before diverging way from it as the railway bed took over again. It took us back into the open country side along a tree lined route which was very pleasant to cycle along. The trees became more abundant as we carried on winding our way along the track. We seemed to be tracking along the side of a hill and at times we travelled through deep cuttings in the rock where the railway engineers had gouged a way through for the track. To our left we could see a motorway getting closer until we turned right down a steep decent and ended up right next to it. This continued and eventually we crossed underneath the motorway before ending up next to another one (from the C-65 across to the C-35). The trail hugged the motorway for quite a way and it went up and down a lot to follow the contours of the hill which was quite tiring on the old legs. We headed into Llagostera where we headed across town on a wide gravel pathway. It seemed largely residential with just the odd shop dotted here and there. It was very quiet. We quickly crossed the town and the trail sped on through the country side crossing the odd main road as we went. In the very far distance you could see the mountains rising up. This would be the Pyrenees making an appearance again as we headed back northward around the circle of Pirinexus. The next few miles were through fields and wooded areas until we arrived in Cassá de la Selva, the last town on the map before we closed the circle. We were on a road side cycle path again passing between streets lined with houses before the landscape changed to a more industrial one. We kept on, crossing over a couple of roundabouts until the road joined a larger road, the C-25. A left turn took us to a large roundabout which had some large corks in the centre. We’d made it! The circle was complete! We were exhausted but jubilant. What an achievement. Our trip was not quite over yet as we had started and therefore needed to finish the trip at the Sallés Airport Hotel. This meant we had to travel back along the busy link road towards the airport. It was rather unpleasant on the way out so would likely be as equally unpleasant on the way back. Either way we had no choice. We were determined to complete our small modification to Pirinexus. Photos taken, we headed off back down the main road in the traffic, passing back through Campllong and Riudellots de la Selva again. We passed beneath the A-2 motorway and saw the hotel on the left. We pulled up to the front of the hotel at about 5.30pm when our version of Pirinexus was done. It was over. What an adventure. Our biggest challenge yet. It had been very tough at times with the heat and the huge amount of climbing involved at almost 17,500 feet over an around the Pyrenees, but we had enjoyed every minute of it – well almost every minute of it. Two large beers were ordered in celebration of our achievement and then two more before we dismantled our bikes and packed them away back into their bike bags. We missed the spa by a few minutes but we didn’t mind. We just had another beer instead. We got showered and changed before we went down to the restaurant for dinner and a bottle of wine. The food was not up to the standards of the El Horreo but it was okay. I think we were too tired to care too much. Then it was early to bed as we were up at a ridiculous hour tomorrow to get to the airport for our flight back to the UK. We got a lift to the airport in the hotel minibus and checked in. The flight home was on time and nicely uneventful. The luggage came through in Manchester without any damage, so we were doing well on that front. It was a fair day back in Manchester but cool compared to Spain, which was a welcome relief. We packed our gear into the car and drove back home where we parted our separate ways and spent the day relaxing and telling our families all about our trip. These BGB tours really are incredible. They give so many fantastic memories which stay with you for the rest of your life. We can highly recommend the Pirinexus to touring cyclist. It is hard work and perhaps would be easier a bit earlier or later in the year when the weather is a bit cooler, but either way, definitely get out there and give it a go. You won’t regret it. The Boys Gone Biking, May 2017.